Examining data more closely suggests strongly that Democrats were more energized than Republicans in 2017. The above graph shows changes in turnout from 2016 to 2017 as it relates to the share of a county or independent city that voted for Democratic Ralph Northam as a share of the two-party vote. In general, the more a place voted for Northam, the smaller the decline in turnout from the presidential election. Analysis of the Virginia results does not suggest a bright future for Republicans. Democrats are doing well in fast-growing places and Republicans in shrinking places. This first map shows which counties are growing fastest. Suburban areas continue to show strong growth. In the DC suburbs, Loudoun and Prince William Counties, along with Alexandria and Arlington are on pace for greater than 10% growth. The same is true in the Richmond, Charlottesville, and Fredericksburg areas, as well as Chesapeake and Suffolk Counties outside of Norfolk and Virginia Beach. Slow growth areas are centered in more rural Appalachian and Southside Virginia. 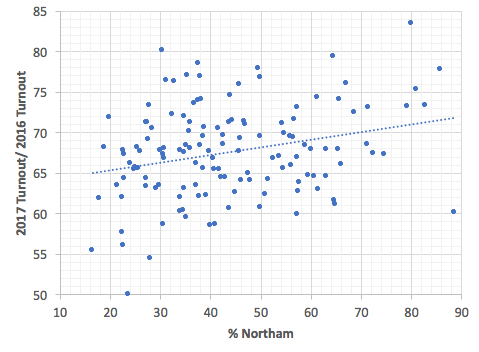 Next up, a map that shows where Northam and Gillespie each made gains relative to 2013. Notice that the blue is concentrated primarily in almost the exact same fast-growing areas. In contrast, places with declining industries where people leave are trending Republican. Not too surprising when one considers that the Trump coalition was based on people who fear change and look to the future with foreboding. It is a fascinating shift, however, as Republicans used to do incredibly well in precisely the sort of exurbs that are among the fastest growing places in the state. Twenty years ago, no one would have imagined that places like Henrico (Richmond suburbs) along with Prince William and Loudoun would anchor Democratic victories. Indeed, Republicans once expected growth in these areas to carry them to power. Not any more. On the Democratic side, we saw a hotly contested gubernatorial primary between Lt. Gov. Ralph Northam and former U.S. Rep. Tom Perriello. Both ran as strong progressives with Northam beating Perriello by the more comfortable than expected margin of 56-44. Perriello did best in his old southside congressional district and in normally Republican low turnout counties in the western part of the State. Northam carried urban Democratic strongholds like Alexandria and Arlington and did even better in places like Virginia Beach and Norfolk. While billed as the Sanders insurgency versus the establishment, this geography doesn’t support that voters especially saw it that way, since Northam carried urban progressive strongholds. I suspect that was inside baseball to most voters who took their cues off of snapshots of the candidates. Something for people still fighting the Bernie v. Hillary wars to remember. Both candidates ran good campaigns and either would have been a fine general election candidate. Kudos to Tom Perriello for conceding quickly once the results became clear and for unequivocally endorsing Ralph Northam. Another good lesson for Democrats everywhere. The Republicans had a much more problematic night that almost ended in total disaster. Former RNC Chair Ed Gillespie, who nearly upset U.S. Mark Warner in 2014, ran a campaign in which he advocated standard Republican calls for massive tax cuts and did his best to avoid controversy or commentary on Trump. In contrast, Prince William Board of Supervisors Chair Corey Stewart, known in the past for his staunch anti-immigrant efforts and being fired as Trump’s state campaign chair, ran an incendiary campaign in which ran as Trumpier than Trump, embracing Confederate monuments and getting lots of free media. Despite huge financial advantages and near universal establishment support, Gillespie eked out a victory over Stewart of 43.7 to 42.5. Trump remains popular among the diehards who tend to vote in low turnout Republican primaries. This does not bode well for people who would like to see the party steered away from extreme right-wing populist Trump-style politics. Probably very bad for Republicans but even worse for Americans who need two responsible, viable parties. Though Republicans just avoided the nightmare scenario of Stewart as their nominee, Gillespie’s narrow win when a blowout was anticipated takes the wind out of their sails, which doesn’t help as he was already trailing either Northam or Perriello in the polls. It doesn’t demonstrate strong support for the nominee and, contrary to his near upset of Warner, weakens confidence that he knows how to run a good campaign in tough terrain.